We are 10,000 schools worldwide and growing! Most public and private schools are just variations on the conventional form of education. Riverstone Montessori Academy is excited to provide a truly unique approach that works for both remedial and advanced students. We offer Cobb County's most advanced, truly individualized academic program starting in preschool and extending through Middle School. The success of our program allows our Middle School graduates to easily score at high school or college level on traditional achievement tests while gaining a skill set to succeed in future academic and professional environments. As you visit our site you will find information on the challenges facing education in the US, the failures of the conventional approach and the success of the AMI Montessori approach worldwide. Raise your education expectations: compare AMI Montessori schools to other area public or private schools and discover something truly amazing in education! Trevor Eissler, father of three Montessori students, a business jet pilot, author, and international speaker, talks about his experience with Montessori education. Much like stones in a stream, smoothed and transformed by the flow of water and their effects on one another, Dr. Maria Montessori believed that a student's later interest in education is dramatically influenced by his/her early educational environment and experiences with others. Her expectations have been borne out in the testimonials of modern IT entrepreneurs. Sergey Brin & Larry Page founders of Google, Will Wright creator of TheSims and Jeremy Allaire of Brightcove video platform specifically identify their early Montessori education as instrumental in their success. The creators of Wikipedia, Amazon and others were also former Montessori students. Riverstone Montessori Academy is excited to provide an advanced educational setting designed to encourage values of integrity and compassion within a framework of advanced academic study and professional development. We look forward to inspiring the innovators of tomorrow! 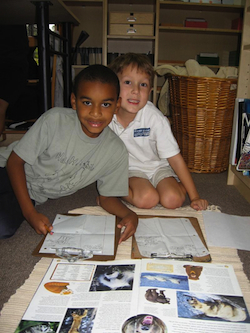 An AMI Montessori education may be very different from your previous experiences. It is a developmentally based system of education spanning 14 years. Our program was methodically designed by a trained physician over fifty years of study and scientific research. Dr. Maria Montessori focused on determining how children learn best during different stages of development and what is necessary to insure each individual child's success regardless of ability. While aspects of the program are continually integrated into traditional schools, and though it is found in countries around the world, people unfamiliar with Montessori Education are often unsure of how this successful program works. Following the 100th anniversary of AMI Montessori education, Riverstone Montessori Academy seeks to raise the educational expectations of parents and education professionals in the community. At Riverstone, our curriculum and test scores easily challenge and surpass those of other private, magnet, or public schools in Cobb County. We encourage parents to seek alternatives to the problems inherent in traditional classrooms and give their child the best education available. Riverstone invites you to compare the curriculum and test scores of other area public and private schools to what RMA has to offer. Unlike many private schools, whose admissions focus solely on the needs of academically advanced students to insure high test scores, Riverstone seeks to help both remedial and advanced students discover their full potential. Our curriculum is designed to improve confidence and provide an opportunity for all students to perform above traditional expectations. Struggling students discover that the AMI curriculum can address their individual learning styles to improve their performance. Advanced students, bored with the slow pace of a traditional classroom, enjoy the opportunity to broaden their studies. Both learn to value education and enjoy the freedom to go as far as their minds will take them. Riverstone values the diversity of its student body and the opportunity to learn about current and historical differences among peoples and nations around the world. We welcome students of different faiths, cultures and backgrounds to join our educational community. Utilizing the AMI Montessori curriculum, Riverstone helps develop a student's self-esteem, cultivates leadership skills and instills appropriate conflict resolution behaviors. Students are instructed in age appropriate social interaction which is important in the acquisition of future nurturing skills. The social component is as important as the academic portion of our curriculum. Students who graduate the complete AMI program are poised to succeed in any advanced educational environment. Starting at age 3, students are instructed in proper food preparation and nutritional guidelines. Students are taught healthy eating habits and help prepare their own tasty food and snacks. Physical education is focused on improving stamina, flexibility and coordination. Riverstone integrates an in-depth study of the Atlanta Opera, the Atlanta Symphony, exhibits at the High Museum of Art and Shakespearian works into its curriculum. 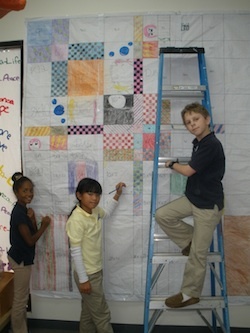 Student's gain an understanding and appreciation of literature, history and artistic expression in a variety of mediums. Throughout the year, Riverstone students participate in a variety of social justice projects to understand the scope of needs and social conditions of others in our local, national, and international community. Leading by example, Riverstone Montessori Academy seeks new and innovative ways of leaving the smallest footprint on our environment. Students participate in different school projects and explore ways they can work with government agencies dedicated to addressing environmental issues.